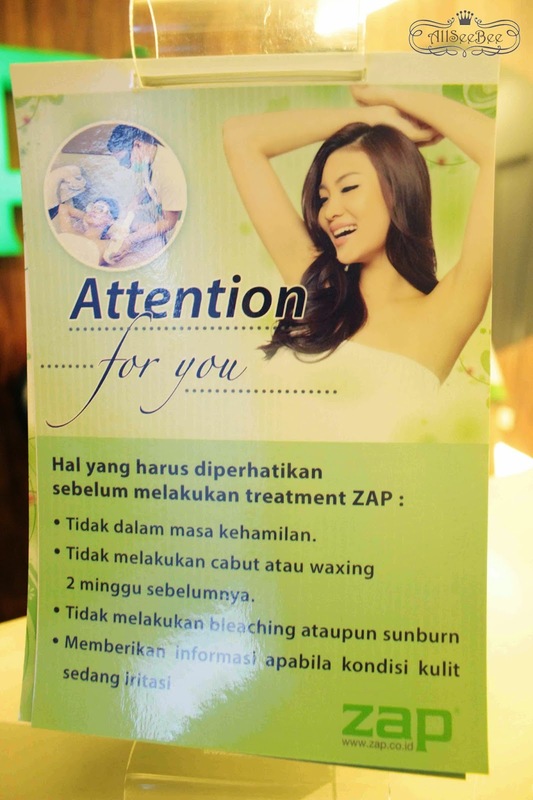 If you read my previous post about Beauty Blogger Event Report, I mentioned that one of the sponsor of the event was ZAP Permanent Hair Removal and they gave us, beauty bloggers, a one time underarm hair removal treatment voucher. I made a visit to ZAP Mall of Indonesia a while ago, right before the voucher's validity date end and just right before they close that day. Yeah, I've been soooo busy lately and just have time to visit ZAP in the afternoon. So, once you arrived at ZAP and it's your first visit, just like me, you have to make an appointment for a treatment. 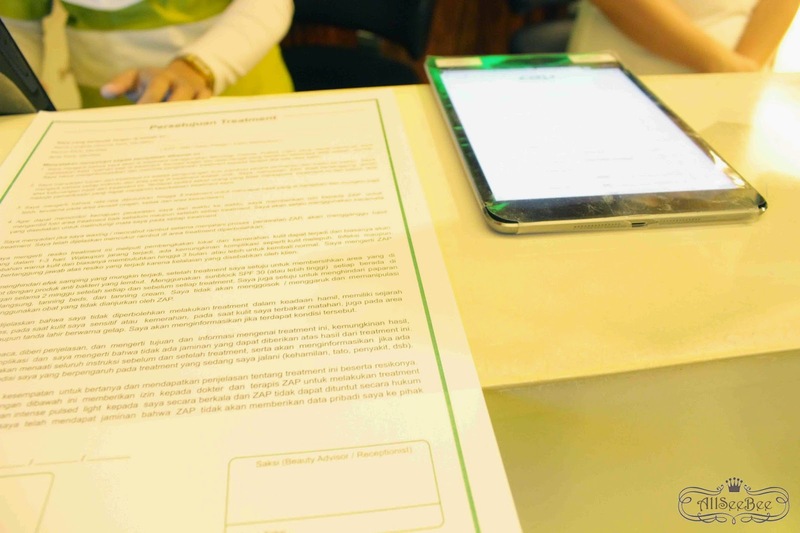 After that, you need to fill a virtual form on a tablet and also sign a treatment agreement. The content of the agreement was about that you know about your own condition and you know and understand about the treatment. - You are not in pregnancy. 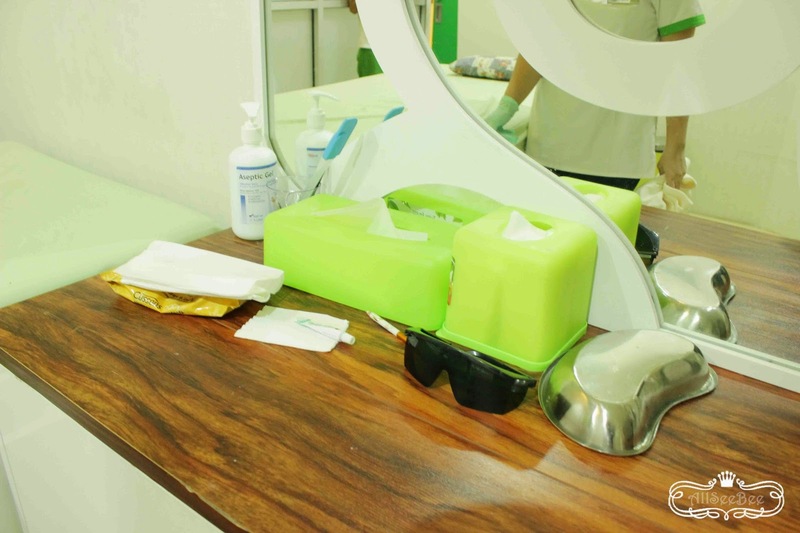 - You can't do hair removal such as waxing or pulling your hair with tweezers, two weeks before treatment. - You are not bleaching you hair recently or having a sunburn. Oh yeah, if you have some skin condition, you should tell the therapist before treatment. Just before I did the treatment, the therapist asked me whether I was in PMS or in menstrual period. I asked her back why, she said that the treatment might feel a little bit painful if you are in that state. Oh well.. 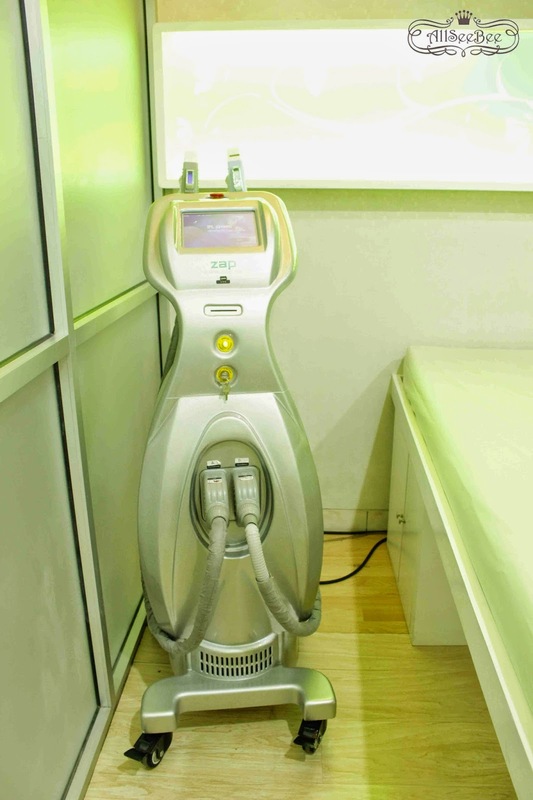 This is the treatment machine that will treat you hair roots. The machine will treat you hair root with lighting methods. You need to used the sunglasses when the therapist treat you with the hair removal machine. So, before the treatment begin, they provide a strapless towel for you to change your clothes. Well, I am so sorry, I can't provide you any picture of me having the treatment, because you know it means that I will showing my skin to you which I can't. But don't worry, I will tell you about the process so you can have an information before you decide to do a hair removal treatment at ZAP. - The therapist will start the treatment by cleaning the area that will be treated with baby wipes, in my case it was my underarm area. - Then, the therapist shaved my underarm hair. - After that, the therapist will applying the aseptic gel on my underarm area. - The therapist started to treat my underarm area with the hair removal machine. The feeling was like a pinch. If it's too painful for you, you can tell the therapist so she can reduce it for you. - Once it finish, the therapist cleaned the aseptic gel and applied anti irritation cream on my underarm area. I would not say that it was not painful, but maybe it was like a little electric shock, just like someone pinched you. So, I think you can still handle it. 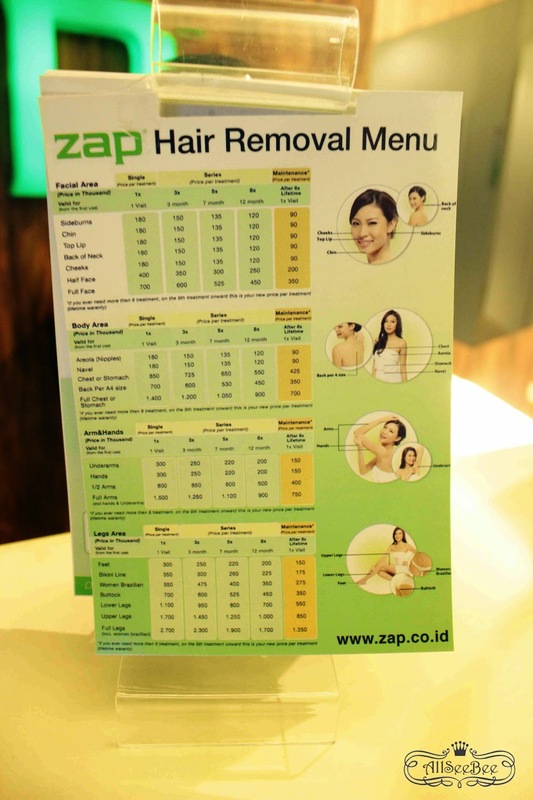 So, ZAP not only provide a hair removal treatment, they also provide various products such as underarm lightening cream. Oh yeah, to get the permanent result it required about six to eight times treatment depend on your condition. As for me, the therapist said that first time treatment will show you just like a post-shaving-result. With society being what it's these days, it's additional possible to envision a well trim man. Having a railway sexual look is traditional and most men each heterosexual and homosexual alike area unit enjoying a visit to the spa, for more information click here hair removal for men.